Clarijs Shopper XL Black #17 - J.C. Lind Bike Co. 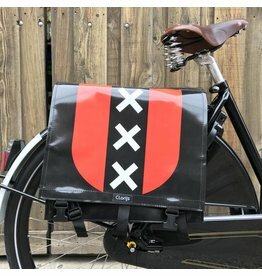 If you have a set of the Clarijs panniers, you're probably accustomed to keeping them attached to your bike (you might even have them locked there). As convenient as it is to have them permanently on your bike, sometimes it's nice to take a bag in with you somewhere if you intend to fill it up (such as at the grocery store). For that exact purpose, Clarijs makes the Shopper--a portable, durable bag with handles that can insert directly into your Clarijs panniers. These bags are made out of the same durable, waterproof bisonyl PVC fabric (truck tarp) material as the Clarijs panniers. The interior dimensions of the bag measure 12.5" high x 13" long x 6.5" wide. Their simple rectangle shape is flat on the bottom, so they stand up easily if you put them down, which is a pretty important improvement over your average reusable grocery bag (not to mention they'll probably outlast your average reusable bag by several years). 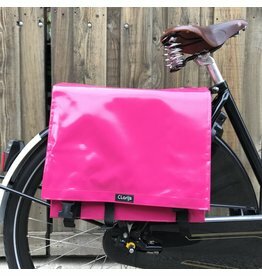 As with the Clarijs panniers, you have your choice of colors to either match or complement the color scheme you have going. Clarijs makes these saddlebag-style panniers out of durable, waterproof truck tarp, in a variety of colors. This one is black. Clarijs makes these saddlebag-style panniers out of durable, waterproof truck tarp, in a variety of colors. This one is fuchsia. 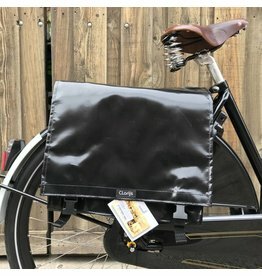 Clarijs makes these saddlebag-style panniers out of durable, waterproof truck tarp, in a variety of colors. 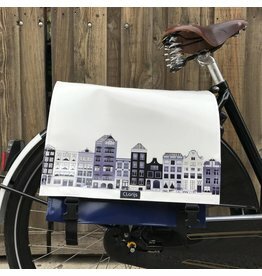 This one is a custom print of the Amsterdam city flag.